Welcome to the home of the Eternal Tournament Series (ETS)! Debuting in 2016, we are a community organized and run tournament series for the Eternal Card Game. We run free, open-registration events regularly on Saturday with Top 2 prizing provided by our sponsor, Inked Gaming! We’ve also been sponsored by Dire Wolf Digital and selected as the community-run tournament organization that will host the 2019 Community Championship! The winner of this tournament will earn an invitation to Dire Wolf Digital’s $100000 World Championships! Along the way, participate in the ETS’ $1500 Invitational tournaments and attempt to qualify for our own $5000 ETS World Championships! Only four weekly events remain before ETS Worlds ramp up begins, so register today! The registration deadline is 10 AM Eastern / 7 AM Pacific / 2 PM GMT on the day of, and the actual event starts at Noon Eastern / 9 AM Pacific / 4 PM GMT. Being on the Discord ( https://discord.gg/eternal ) is required to participate in events! If this will be your first ETS, please review the Rules and our guides on How to Register and what to expect On The Day of the Event. Already familiar with the ETS? Check out the updates for 2018.. Please check the Tournament Schedule to find out which weekends the ETS is running events. Anyone who wishes may freely enter an open tournament. Eight Weekly tournaments are run every season on Saturdays. Weekly tournaments open to anyone who wishes to attend, regardless of collection size, experience, or renown. The tournaments cost nothing to enter and only require the time commitment to play. While they do not provide cash prizes, they do grant points that lead to invitations to our invite-only premiere tournaments, which have cash prizes. ETS Weekly Tournaments are Swiss System tournaments. After a certain number of Swiss rounds, the regular tournament will end and the top players will move on to play in a single elimination tournament to decide the Tournament Winner and Finalist. The number of rounds and the size of the secondary tournament is subject to change based on the number of registered players. More than 226 players: Additional rounds of Swiss, as necessary. Top 8 playoff. Registration closes two hours before the event begins. Check-in: Players who have registered for the event must check-in on the Battlefy tournament page prior to the event commencing. Check in closes at NOON EST. Seeding: Players are seeded randomly in weekly tournaments. Tiebreakers to determine which players make the secondary single elimination tournament will be determined by Match Wins > Opponent Match Win Percentage. The Top 8 will be announced by a Tournament Organizer after the Swiss portion of the event has ended. If more tiebreakers are required, the Tournament Organizer will determined the method to be used. Points: Weekly tournaments award both Invitational Points and Series Points. Descriptions on how to earn these points can be found in the appropriate section. If a bye should occur, the round will count as a match win for the player with the bye and they will be awarded an Invitational Point. Rules: More detailed rules for all events can be found here. Players will play matches according to the normal tournament rules. In Top 8, however, matches become Best of 5. Rounds will start and end as players begin and finish their games. There is no time limit for rounds in single elimination. Our sponsor Inked Gaming has changed things up for 2019! In additional to any points or invites they may win, the player who comes in first place in a weekly tournament will earn a $25 Inked Gaming gift card. Additionally, one lucky viewer will be chosen at the end of round 3 every week to win a $10 Inked Gaming gift card! This will also mark the beginning of ETS purchasable swag supplied by Inked Gaming, which will be rolled out in the next week or so. Premiere tournaments have even more cool prizes to win (in addition to cash prizes). 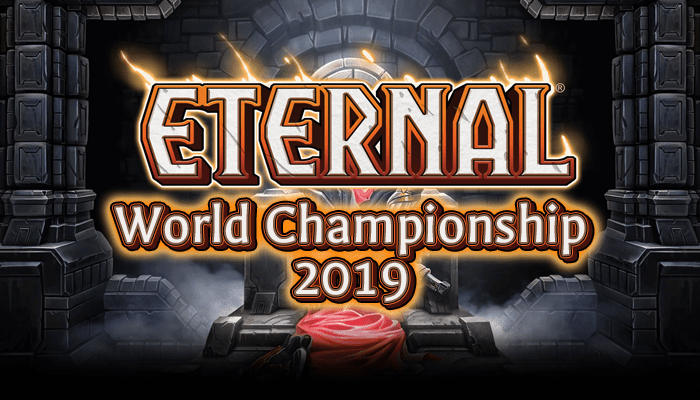 Eternal Tournament Series tournaments currently operate on a four-season-per-year system. Seasons are 10 weeks long, beginning with the first weekly tournament and endingwith the Invitational. Invitational Points are earned for the duration of the season, but at the beginning of the next season reset and you must again begin earning Invitational Points. Exact season start and end dates can be found on the Tournament Calendar. A full schedule of events can be found on the Tournament Calendar. Invitational Points are a representation of how many tournament matches a player has won in the course of a given Season. They are earned by winning matches in Weekly events. The primary purpose of Invitational Points is to qualify players for Season Invitationals, which are described below. A more detailed explanation of Invitational Points and how to earn them can be found here. Series Points are a measure of a player’s tournament success throughout the year, and are earned via high placements in events. The primary purpose of Series Points is to qualify players for the World Championships, which are described below. A more detailed explanation of Series Points and how to earn them can be found here. A Rookie is a player who has played in their first ever ETS event in the current year. Rookies are eligible to win the title of Rookie of the Year, which is awarded to the Rookie with the highest SP total at the end of the year. There are no prizes attached to this title. Invitational Tournaments take place over 2 days and feature at $1500 prize pool. They are free to enter, but you must be invited to enter them. For more information about Seasonal Invitationals, check out the Invitational Tournament Rules page.